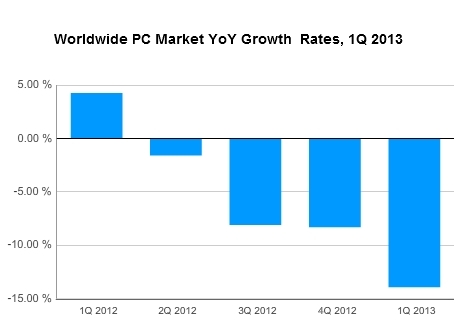 Worldwide PC shipments totaled 76.3 million units in the first quarter of 2013 (1Q13), that's down by -13.9 percent compared to the same quarter in 2012, according to the latest market study by International Data Corporation (IDC). To put this decline in perspective, this market performance was the worst since IDC began tracking the PC market quarterly in 1994. The results also marked the fourth consecutive quarter of year-on-year shipment declines. Despite some mild improvement in the economic environment and some new PC models offering the troubled Microsoft Windows 8 operating system, PC shipments were down significantly across all regions -- when compared to a year ago. Fading mini notebook PC shipments have taken a big chunk out of the low-end market while tablets and smartphones continue to divert consumer spending. PC industry efforts to offer touch capabilities and ultra-slim systems have been hampered by traditional barriers of price and component supply, as well as a weak reception for Windows 8. The PC industry is struggling to identify innovations that differentiate PCs from other products and inspire consumers to buy, and instead is meeting significant resistance to changes perceived as cumbersome or costly. "At this point, unfortunately, it seems clear that the Windows 8 launch not only failed to provide a positive boost to the PC market, but appears to have slowed the market," said Bob O'Donnell, Vice President at IDC. Microsoft will have to make some very tough decisions moving forward -- if it wants to help reinvigorate the PC market. Meanwhile Intel can no longer afford to hope that the current situation improves. IDC believes that the impact of slow demand has been magnified by the ongoing restructuring and reorganizing efforts impacting HP and Dell -- two key players that have clearly lost momentum. Lenovo remains a notable exception as it continues to execute on a solid attack strategy. Mid- and bottom-tier vendors are also struggling to identify growth markets within the U.S. Among the most vulnerable group of vendors are the whitebox PC system builders, which are undergoing consolidation that is affecting shipments as well as the distribution sector. In summary, the PC industry is now at a critical crossroads, and strategic choices will have to be made as to how to compete with the proliferation of alternative devices and remain relevant to the consumer. If you doubt the severity of the situation, then just consider the results in the U.S. market. It had yet another dismal quarter in 1Q13 -- contracting -12.7 percent year on year -- with a drop of -18.3 percent compared to the fourth quarter of 2012. With total volume falling to 14.2 million, quarterly shipments reached their lowest level since the first quarter of 2006. With this latest figure, the U.S. is now in its tenth consecutive quarter of year-on-year contraction (excluding a brief moment of growth – less than 2 percent year on year – in 3Q11). It's difficult to forecast a forward-looking upside, given this backdrop. But perhaps there's opportunity for the surviving vendors -- who could still rejuvenate the PC form factor. Is a PC industry recovery likely to be the outcome? Only time will tell.